The original score GRAMMY award-winning and Rock-and-Roll Hall of Fame guitarist, SLASH, released the score composed and produced for Universal Studios Hollywood’s “Halloween Horror Nights” maze, “Universal Monsters,” which can now be heard around the world on Spotify, the free music streaming platform. · “We Belong Dead” – inspired by Frankenstein Monster’s immortal line from the explosive finale of The Bride of Frankenstein, this track fuses Gothic themes with a contemporary EDM/Dubstep feel to set the tone for the horrific experience to come. · “The Danse of the Dead” – inspired by “Danse Macabre,” the late medieval art movement that celebrated “the universality of death” and influenced the famous masquerade ball scene from The Phantom of the Opera, this track sets the stage for the Monster’s Masquerade sequence in the maze. · “The Final Scare” – this guitar-driven, up-tempo track combines an old school Punk Rock feel with modern electronic sounds to drive the adrenaline-fueled finale of the maze, where multiple monsters attack. · “Universal Monsters Rising” – SLASH’s signature lead guitar joins with the mournful sound of a tolling church and the sharp, staccato stabs of violins to call guests to the graveyard, where the Universal Monsters are waiting to rise again. · “The Collection Room/Dracula’s Lair” – composed to accompany The Mummy and Dracula sections of the maze, this track transitions between Middle Eastern and Eastern European instrumentation to help bring to life these two Classic Monsters. 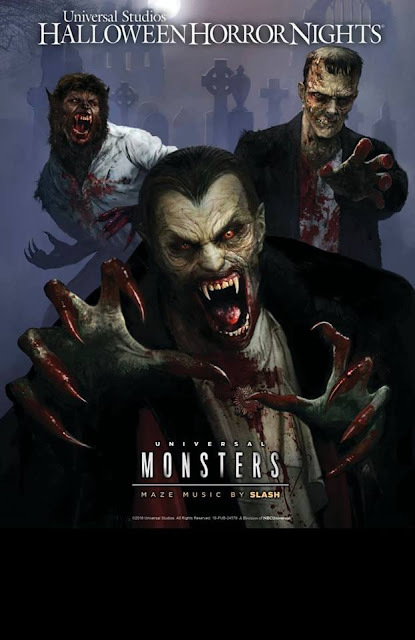 · “Monsters, Maniacs and Madmen (Universal Monsters Maze Medley)” – this compilation track, encompassing several scenes within the maze, takes a single haunting melody and transforms it throughout the arrangement, handing off from piano to guitar, violin, pipe organ and even the synthesized/sampled Opera singer’s voice to create a series of sinister moods. · “Sweet Licks (music from “Clowns 3D”) – composed for 2014’s “Clowns 3D” maze, “Halloween Horror Night’s” first collaboration with SLASH, this track creates a creepy carnival vibe to help tell the story of a diabolical family of clowns who run a twisted ice cream factory. SLASH and his band, SLASH FT. MYLES KENNEDY AND THE CONSPIRATORS which features SLASH (guitars), MYLES KENNEDY (lead vocals),TODD KERNS (bass/backing vocals), drummer BRENT FITZ (drums) and rhythm guitarist FRANK SIDORIS (rhythm guitar) just wrapped a sold-out, nationwide, headlining tour in celebration of the release of their new album LIVING THE DREAM. The band’s third full-length release and first new music in over four years,LIVING THE DREAM (Snakepit Records/RoadRunner Records) is available for purchase or streaming:HERE. Fueled by the Top 10 rock song “Driving Rain,”its live-action, animated video as well as the best critical acclaim of their career, LIVING THE DREAM debuted with 10, Top 10 chart placements around the world. The first single “Driving Rain” jumped to #6 this week and climbing--marks the band’s 6thconsecutive, Top 10 single at radio and SLASH’s fastest-rising single ever in his solo career. The LOS ANGELES TIMES described LIVING THE DREAM as “his best work since the demise of Velvet Revolver. …full of “unexpected funk, boogie, blues and garage rock influences.” While ROLLING STONE declared the album “a biting blues filigree at the end of a riff, weeping solos full of long notes, boogie-woogie riffs.” Elsewhere, CLASSIC ROCK hailed “the bands third and Best Album, ‘The Great Pretender’ is the album’s masterpiece and one of the best things Slash has ever done.” Read the full Q&A where SLASH and MYLES KENNEDY breakdown LIVING THE DREAM in its entirety HERE. Once more the spooky sounds can be found here!